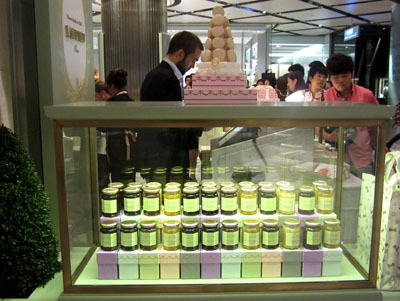 Famed French Patisserie Laduree, inventor of the double deck macaron, arrived in Sydney this week to excite and entice us with their highly prestigious macarons, sweet delights and indulgent experiences. 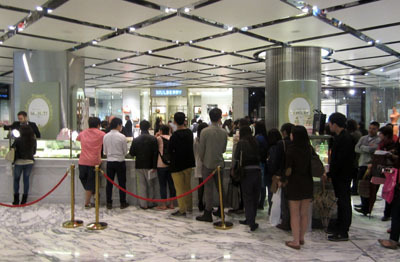 Like any good macaron lover, I excitedly whirled my way to Westfield Sydney to pursue my decadent desires, only to find a multi-folded line of patient people waiting to be served. Asking how long would it take until I could wrap my lips around these little morsels, I was told; mmmmm about 1.5 hours! Lined up and waiting patiently, the wait time? 1.5 hours! Patience is not my virtue, there had to be a quicker alternative. Spotting another queue which led to the small sugary tea parlour, I joined it. Wait time? 10 minutes. 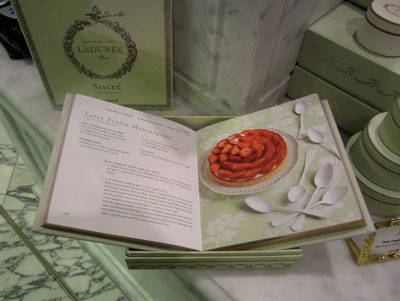 Do take this option to immerse yourself in the full 'Laduree Experience'. Beautiful packaging. Purchase a box in many sizes and it comes in a dainty bag so you can skip down the street. Licorice, Strawberry and Marshmallow,Pistachio,Chocolate,Raspberry and Lemon. A dainty Marie-Antoinette inspired tea parlour decked out with luxuriously appointed rich upholstered chairs and round gloss black tables. Shiny silver sugar pots and a Laduree pink and white tea cup set created a mood. Macarons are made in Switzerland and flown into Sydney until they set up their own patisseries. The trademark pastel green menu arrived with all the options of indulgence. In my excited state I asked the waiter to bring me his suggestions from the range of 18 sweet flavoured macarons. No coffee or milk in sight on the menu of drinks, only fragrant black teas, so again I asked for the waiter's suggestion. The line up was getting longer and longer and I felt a little smug sitting at my table waiting for my order which arrived quite quickly. Little did they know, you can order 'take away' from the table as long as you order a drink. I was not in a hurry to let them know as I was basking in my secret find. 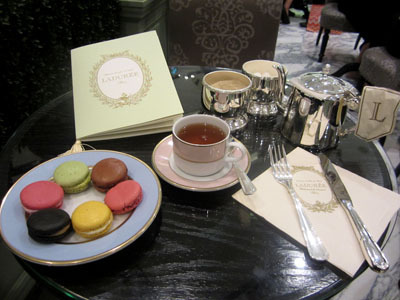 My Laduree experience, high tea! My box of six bright macarons sat before me. Holding back my excitement I began to nibble and savour each little morsel, contented that I had finally tasted the original French crafted Laduree macaron. Ahhhh. A rather large pot of a fragrant Marie-Antoinette tea was poured before me. A bouquet of essential oils with subtle citrus fruit, rose and jasmine flowers and honey wafted into my face. I popped in a sugar rock and stirred. The blended delicate flavours were distinct and sweet, understanding you would not drink anything harsher to complement these dainty macaron delights. Pots of tea are $7.50, from which I poured about 3 cups. Pretty pastel boxes to lay your sweet cakes in, choose a colour and size. From the delicate pastels and gold packaging, the Marie-Antoinette inspired decor, marble counters and shiny silverware Laduree creates an experience, and a sweet one at that. I was oh so happy. 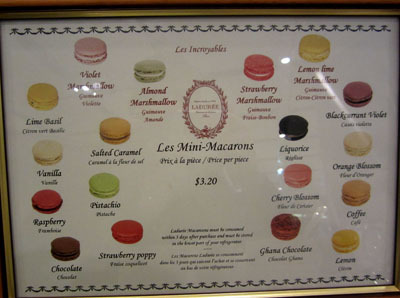 These macarons are not so cheap, at $3.20 each for take away to $4 each to dine in. Nibble slowly and savour each mouthful. I recently wrote an article on What are Sydney's Most Unlikely Macaron Flavours?. 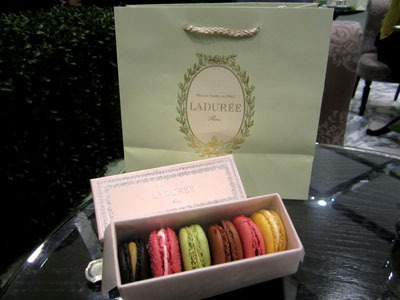 Now you can see why the arrival of Laduree was so exciting for me. It explains the little cake's history, dating back to Italy in the 1500's, to Carmelite nuns in the French Revolution, then to 1930 when Pierre Desfontaines - the grandson of Laduree Patisserie's founder - created the double decker as we know them today. Purchase a box of fragrant tea for $24/125 gm. 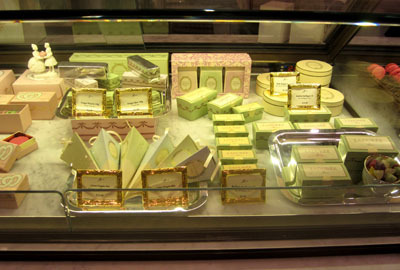 Although it bought them to fame, Laduree is not all about macarons. Their range of delicate sweet black and green teas blended with florals and fruits are some of the most divine I have tasted. You can purchase the teas in round boxes @ $24. 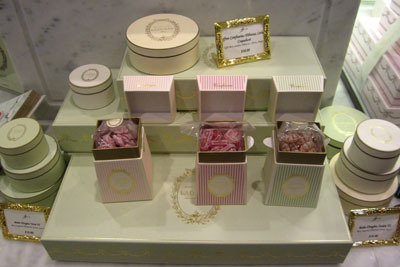 Gorgeous boxes of candies flavoured with flowers. Nougat and candies boxed up for a special thank you gift. A gorgeous range of candies, nougats and jams are all delicately flavoured with blossoms and fruits and beautifully presented in tiny boxes to make them a special purchase for yourself or someone you care for. Be aware this type of gift does not come cheap, which in one way makes them special. Ranging from $15 for a small box of candies or nougat to $24 for 125gms tea. If you don't have a sweet tooth, you can have a sweet smell with these candles and fragrances or purchase a recipe book. Try your hand at baking with a recipe book. This Sydney pop up store is the first in Australia with more to come, depending on their success. 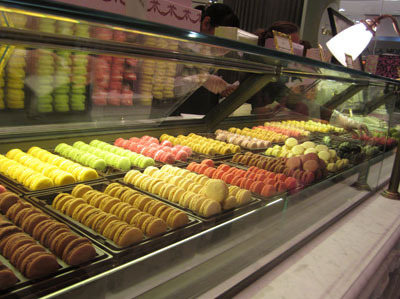 At present the macarons are made in Switzerland and air freighted until they set up their own patisseries. Arriving soon are cakes, not sure what type, but I'm sure I will be back to sample. Selection of 18 flavours to choose from. Macarons like coffee are very subjective and personal to each person's taste. 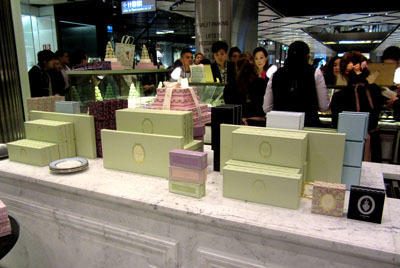 Laduree's are delicately flavoured, so don't expect overly sweet vibrant flavours. I have my favourites around Sydney, yet I have a very sweet tooth and love unusual flavours. 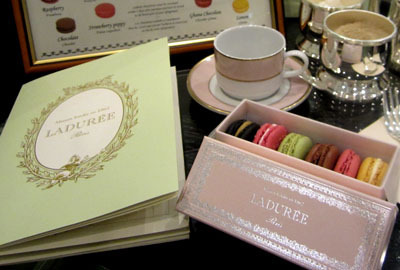 Laduree Patisserie is the ideal place to go with a few friends to experience a mini high tea. Their packaging is superb which make an ideal gift for someone special. My experience cost $30 for 6 macarons and a pot of tea, so perhaps keep it for a special occasion. Why? To taste what many claim to be the best macarons in the world. 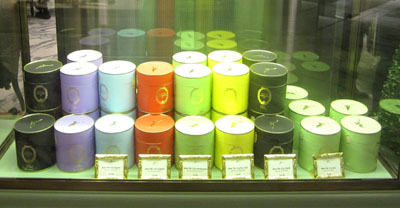 Disappointed to hear they aren't serving hot chocolate - the Laduree stores in Paris do a great hot chocolate! Looks gorgeous. I'm generally not a macaron fan but am definitely tempted after these pics and article.